HeliCalc is a free, web-based program which calculates the length, density and quantity of Super-7 warm roof fixings required for a specific project. The data is calculated using a design method, formulated by Ancon Ltd and independently approved by the Building Research Establishment, which is applied to the results of a comprehensive and independent test program carried out by CERAM Building Technology using Thor Helical fixings. 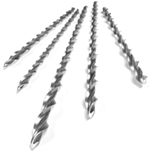 The Super-7 helical nail secures counterbattens to rafters, without compressing insulation material, in warm roof applications. Unlike other helical fixings, the helix of the Thor Helical range is engineered with a precise pitch that cuts a consistent path through the host material (European patent 1307303). Each rotation interlocks perfectly down its length, guaranteeing maximum performance. Use of the Patented Alignment Tool can improve build quality. The tool fits a 38mm or 50mm wide batten and vertically aligns a Super-7 warm roof nail centrally on the counterbatten to rafter arrangement.